Australia’s manufacturing sector rebounded in August on the cusp of two years of uninterrupted expansion, with the Ai Group’s performance of manufacturing index (PMI) rising 4.7 points to 56.7. The August reading means that the country’s manufacturing sector is enjoying a positive run of 23 consecutive months in expansion – its longest run of recovery or expansion since 2005. 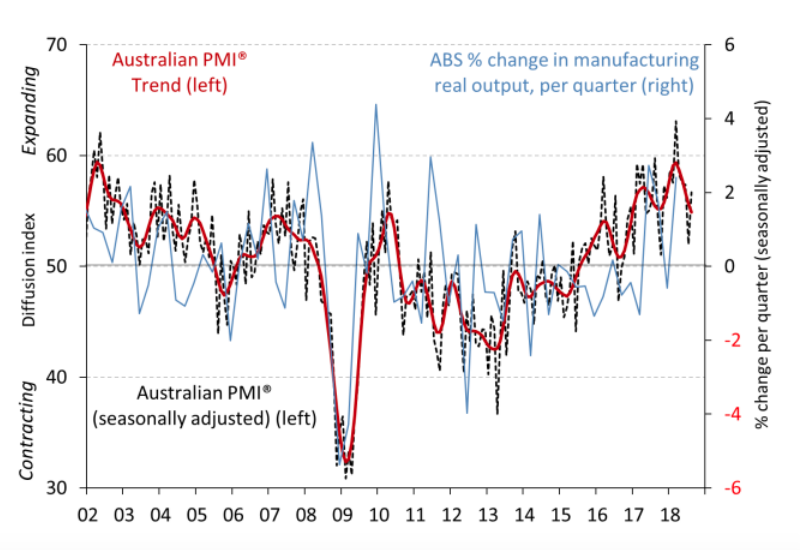 According to Ai Group’s latest survey, all seven activity sub-indexes in the Australian PMI expanded in August, with only inventories decelerating (down 3.6 points to 51.1). Five of the eight manufacturing sub-sectors expanded in August, with expansions in food & beverages, wood & paper products, chemicals, non-metallic minerals (building materials) and machinery & equipment. The metal products sub-sector stood stable at 49.3, with many respondents reporting slowing demand and stronger off-shore competition. The input prices sub-index posted its highest result since March 2011, having jumped 9.3 points to 77.4 in August. Wages also continued to rise (up 4.1 points to a record high of 64.7), with the selling prices sub-index rising by 5.1 points to 58.1 – the highest result for this sub-index since April 2017. “An exception is that drought conditions are also lifting meat production as farmers destock. More positively, all seven sub-activity indexes indicated expanding conditions in August and with new orders continuing to come in at growing levels, the immediate outlook is for further growth in manufacturing production and employment.” Mr Willox concluded.